With a family of six small boys to take care of, Kezi Levin had to do something about her family’s sock bill, and so came up with the idea for Sock Ons, an amazingly simple little gadget to stop socks going astray. Sock Ons have gone through years of research and development - the result is a funky and fashionable patent pending product that actually works! 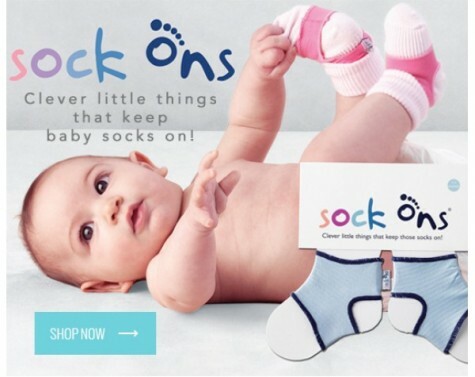 Sock Ons are now an essential item that no baby (or sane parent) can do without! Made of soft, stretchy material, Sock Ons are designed to fit over regular socks, keeping them firmly in place no matter how hard your baby kicks and tugs. Sock Ons are available in 2 sizes: one for 0-6 months, and 6-12 months!